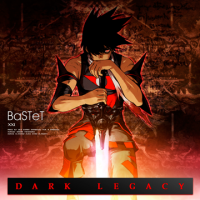 DARK LEGACY shares some similarities with the beatmania IIDX 21 SPADA music select background music, also composed by Naoyuki Sato. The OST version of DARK LEGACY sounds different from the game version. A long version of DARK LEGACY, titled DARK LEGACY-Long version-, appears on the beatmania IIDX 21 SPADA ORIGINAL SOUNDTRACK VOL.2 album. Bastet is the goddess of cats in the Egyptian mythology. Alongside Atröpøs, Adularia, Critical Crystal, and Overload Frontier, DARK LEGACY is one of the beatmania IIDX 21 SPADA default songs to have a BEGINNER chart. DARK LEGACY's BEGINNER chart was removed in beatmania IIDX 26 Rootage. During the first day of beatmania IIDX 21 SPADA's location test, DARK LEGACY's ANOTHER charts were locked. They were available for play from the second day of the location test. DARK LEGACY's ANOTHER charts were locked as well on the final release of beatmania IIDX 21 SPADA. As of February 12th, 2014, DARK LEGACY's ANOTHER charts have been unlocked for normal play in beatmania IIDX 21 SPADA. DARK LEGACY is one of the Refle unlockable songs in REFLEC BEAT groovin'!!. It could be purchased from the Reflec Shop from August 28th, 2014 for 2000 Refle. In REFLEC BEAT VOLZZA and REFLEC BEAT VOLZZA 2, it was playable by default. Various characters from the video of DARK LEGACY appear in the overlays of 煉獄のエルフェリア. DARK LEGACY is available in beatmania IIDX INFINITAS as part of the beatmania IIDX INFINITAS 楽曲パック vol.6. The word SPADA generally means "sword". This work is about the expanded story surrounding a variety of such swords, and the various events which will happen from now that invite our users to this world. The beginning of such a story decorates this music. It begins with silence immersed in the dark which I think enhances the drama of this strong song. Even with only a few scenes with armor, I still had to cut a few images at the time of production. But I thought overall that the song meshed well. In this song, I liked designing the main character with the sword and the others with blue clothing. Both boys and girls studying together at a school. Unaware of the racial and ethnic conflicts, the country split in two. Battles were repeated on land continuously, exhaustingly, and the boundaries between both became unclear. Each country then began taking their own courses. One revived the forbidden ancient magic, and began to enhance their armed forces. An unreliable boy named Toledo received the crown and became king. A clever boy named Theo became his adviser. The other country detested the use of dark magic, and sought for peace against an invasion. A free-spirited boy became a strong young man. The caring and good girl Yaffa became his wife. On the day of the wedding, the power of the ancient demon influenced King Toledo with tremendous power. Turning a deaf ear to Adviser Theo's counsel against it, Toledo's mind was attracted to this power. Soon after, the country was destroyed in an instant. In that country, a new sun was born on the earth, and a bomb blast came down on that town. A great roaring sound was heard, and a rain of fire that could not be stopped poured down. On that day. A day that is supposed to be the happiest for a lifetime. When Yaffa became a wife, her happiness was cut short by death. A ceremony that was supposed to be full of celebration and blessings was instead filled with screams and rubble. The young man heart was broken. His heart became empty, and nothing could be done to fill all of the holes made by such a tragedy. In those empty days, he then remembered the voice of the monks. He heard the monks telling him to travel. He went off to an ancient civilization that died off long ago. He found the lost dark legacy. He pursed this lost knowledge in faraway lands. It surely was a struggle. A dull, crazy glowing sword. It shone like the brilliance of the devil, yet it was fashioned like a halo from God. The former schoolmates. Young King Toledo. And Minister Theo. Now his enemies. And even if it took his whole life, he vowed to avenge his wife. The young man picked up the sword. One man, crossing across that withered land. His emotions disappearing step by step, he still walked. The sword was forged, and was well-sharpened. He let go of all emotions, and prepared himself. Just one desire. To kill all. Any other emotions that he may have had were no longer needed, because he had the sword. This page was last edited on 19 March 2019, at 16:31.